Chagas disease, caused by Trypanosoma cruzi, stands out due to its socio-economic effects on low-income tropical populations. This disease affects millions of people worldwide. The current chemotherapy for it is based on benznidazole (Bz) and nifurtimox (Nif) and is unsatisfactory. In this review, we will focus on the search for potential target organelles and molecules for the chemotherapy of Chagas disease. We consider as potential target organelles those that are absent or significantly different in host cells and present in the clinically relevant forms of the parasite (trypomastigotes and amastigotes), which are the mitochondrion, cytoskeletal-related structures, the acidocalcisomes/ contractile vacuole complex and glycosomes. Most molecular targets are key enzymes involved in processes that are essential to parasite survival, such as sterol biosynthesis, antioxidant defences and bioenergetic pathways. Among the molecular targets, enzymes of the sterol pathway, particularly C14α-sterol demethylase, are still the most promising target, even if clinical trials with posaconazole and E1224 have failed to sustain efficacy. We believe that in the near future, the Chagas community will have a “clear shot” at new drug candidates for Chagas disease based on the accumulated knowledge about trypanosomatid biochemistry, preclinical studies, advances in screening technologies, the efforts of medicinal chemists in the synthesis of both azolic and non-azolic inhibitors, and the interest of pharmaceutical companies in the development of new antifungal agents, which form a critical mass of information. Keywords: Trypanosoma cruzi, Chagas disease, Chemotherapy, Drug targets, Organelles, Mitochondrion-kinetoplast, Cytoskeletal- related structures, Acidocalcisome-contractile vacuole complex, Glycosomes, Molecular targets, Ergosterol biosynthesis pathway, Ultrastructure. Keywords:Trypanosoma cruzi, Chagas disease, Chemotherapy, Drug targets, Organelles, Mitochondrion-kinetoplast, Cytoskeletal- related structures, Acidocalcisome-contractile vacuole complex, Glycosomes, Molecular targets, Ergosterol biosynthesis pathway, Ultrastructure. Abstract:Chagas disease, caused by Trypanosoma cruzi, stands out due to its socio-economic effects on low-income tropical populations. This disease affects millions of people worldwide. The current chemotherapy for it is based on benznidazole (Bz) and nifurtimox (Nif) and is unsatisfactory. In this review, we will focus on the search for potential target organelles and molecules for the chemotherapy of Chagas disease. 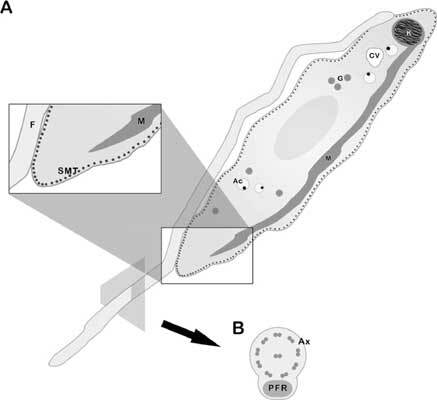 We consider as potential target organelles those that are absent or significantly different in host cells and present in the clinically relevant forms of the parasite (trypomastigotes and amastigotes), which are the mitochondrion, cytoskeletal-related structures, the acidocalcisomes/ contractile vacuole complex and glycosomes. Most molecular targets are key enzymes involved in processes that are essential to parasite survival, such as sterol biosynthesis, antioxidant defences and bioenergetic pathways. Among the molecular targets, enzymes of the sterol pathway, particularly C14α-sterol demethylase, are still the most promising target, even if clinical trials with posaconazole and E1224 have failed to sustain efficacy. We believe that in the near future, the Chagas community will have a “clear shot” at new drug candidates for Chagas disease based on the accumulated knowledge about trypanosomatid biochemistry, preclinical studies, advances in screening technologies, the efforts of medicinal chemists in the synthesis of both azolic and non-azolic inhibitors, and the interest of pharmaceutical companies in the development of new antifungal agents, which form a critical mass of information.